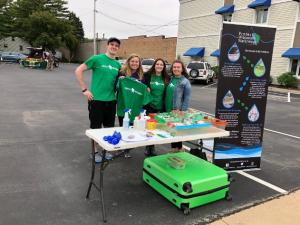 The Protect Wisconsin Waterways crew visited with city residents at the Waupun Farmers Market on June 2nd and August 11th, 2018. Our representatives engaged with citizens and families that share a common interest in sustainable practices. 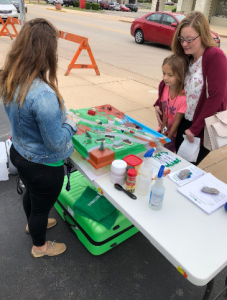 We brought the Enviroscape demonstration to this event and emphasized the importance of properly disposing of grass clippings as this is a large contributor to stormwater runoff pollution during the summertime. Attendees were supportive of our mission and several indicated they already practice some alternative actions around their home that we suggested. After families saw a short presentation on the Enviroscape, they received pamphlets with more information about protecting stormwater. We also encouraged everyone to sign up for our Rock River clean up event planned for September 8. Overall, there was a positive response to our brand and many citizens expressed their appreciation for our mission. We also encouraged individuals and families to sign our pledge to Protect Wisconsin’s Waterways.